The Mothership and I have a good cooking relationship – in my kitchen. In other words – she’s a decent sous chef in my kingdom. Or queendom. Or Spoon-dom. Ha. That sounds funny. Anyway – we do particularly well when we have to do wrapping or decorating. As regular readers have seen in previous posts – she’s got an excellent icing eye (and hand) and an adept dumping wrapper roller. I did the pleating, in that case. 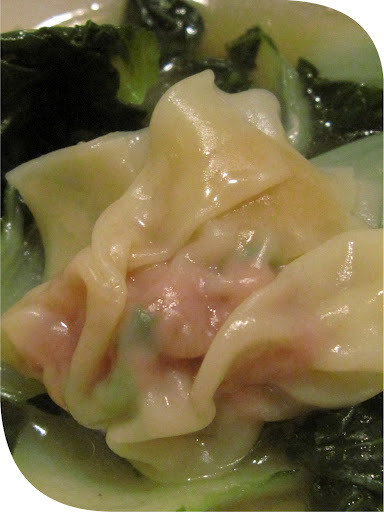 In this particular instance, however, the Mothership revealed some pretty decent won ton wrapping skills! I had just come home from a long day at work – an end-of-day meeting had run long and I didn’t even have time to turn on the TV when the Mothership was a-knockin’. 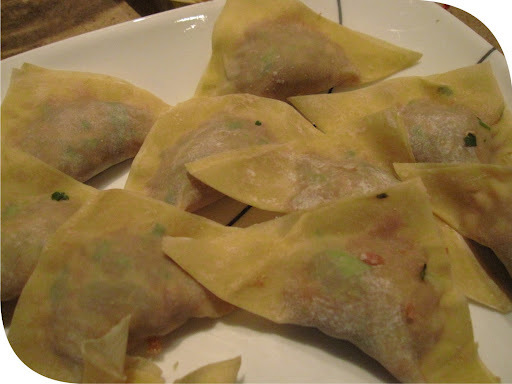 She seemed disappointed that our won ton dinner night was off to a late start, but hey – what am I going to do? I quickly whipped up a filling, put the chicken stock on the hob, and away we went! The filling? Equal parts lean and regular ground pork (1/2 lb each), 1/4 chopped water chestnuts, 1/2 lb chopped peeled shrimp, 3 minced green onions, a spoonful of cornstarch, a generous splash of rice wine and soy sauce. Salt and pepper. Oh, and some of that magic sesame oil. Gotta have the sesame oil. I’d throw in some oyster sauce if I had any. 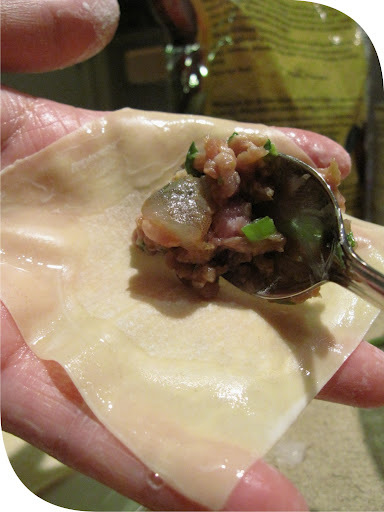 Take some standard won ton wrappers – trace a line of water around the edges, plop a generous teaspoon of filling in the middle and wrap away. 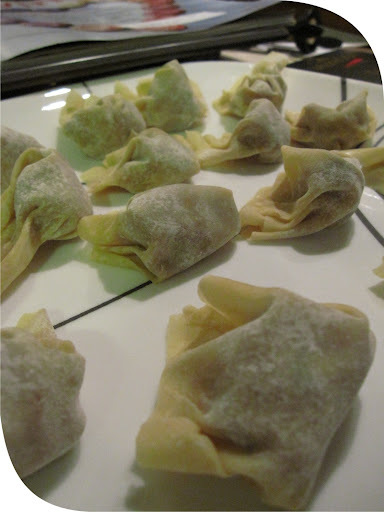 Everyone has different techniques in won ton wrapping – the Mothership employed a more traditional style whereas mine was…Italian-inspired, ha ha. They were cooked in homemade chicken stock and served, with said stock and baby bok choy. And it all took less than an hour!